Quaint and cozy, this privately-rented two-bedroom condo is the perfect getaway for adults. The second-floor location gives you a view but is only a few steps away from one of the world’s most beautiful beaches (we know we’re biased, but this ranking comes from Trip Advisor!) You’ll get a bright, panoramic view of the white sand and turquoise waters of Playa Norte from your soft, luxurious beds. Once you step outside, you’re only a stone’s throw away from the quaint cobblestone streets and bustling nightlife of El Centro. Pool or beach? Get both. This property also gives you access to a pristine pool, round-the-clock security, and an on-site restaurant. Get all the amenities you need for a comfortable stay: soft beds, a bright and clean kitchen, plentiful beach towels, air conditioning and fans. Relax immediately in an interior that’s designed in calming creams and crisp whites, with plenty of exotic plants and pops of Caribbean color. The balcony boasts a large table — start your day with coffee as you watch the waves lap the sand, and the boats venture out to the horizon. And, be sure to spend at least one evening in your front-row seats to some of the most amazing sunsets you’ll ever see. This condo is suitable for children over the age of 10 years old. Welcome to one of the most beautiful and swimmer-friendly beaches in the world. This wide strip of fine white sand meets jewel-toned waters that are calm, shallow, and great for swimming. Anchored boats bob on the horizon, and massage tables can be found amongst the palm trees. Walk along the clean, soft beach or grab one of the many lounge chairs found by the water, where you can choose sun or shade, and often, a cerveza or frosty margarita from the wait staff at the many beachside bars. 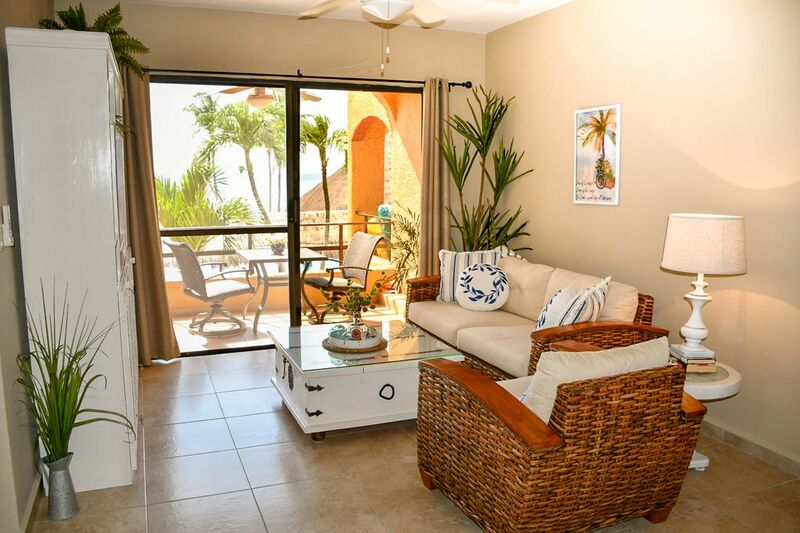 As with every property listed with Isla Mujeres Vacation Rentals, Nautibeach Condo #14 comes with personalized, friendly concierge service from one of our local staff. This complimentary service takes all the stress out of your travels. We can arrange your transportation to the property from the airport, meet you upon arrival, help you get settled and, if you’re interested, introduce you to the island we love. We are experienced (often born-and-raised) locals who have island-wide connections and who are passionate about helping others fall in love with Isla’s charm, beauty, and warmth through flawless vacations. We can help you plan outings, arrange to rent a golf cart or make dinner recommendations. Looking for a higher level of luxury and care? For an additional price, we can even pre-stock your fridge with your favorites before your arrival, welcome you with fresh guacamole and margaritas, and have private outings reserved for you and your guests. PLEASE NOTE that this condo allows children over the age of 10 or infants. We had a fabulous week on Isla. Our condo was beautiful and such a great location! We had awesome food at Javi's, Madeira and many others. Can't wait to get back!! We’ve been coming to the island for nine years. While we have stayed in several nice places, this condo topped them ALL. The views are completely breathtaking and hard to take your eyes off. The condo is exceptionally clean, the bed are extremely comfortable and the kitchen is well stocked. The owner is super nice and helpful. She has gone above and beyond to make this place feel like a home away from home. You can’t go wrong booking this place. We’ll certainly be back! Thank you for your kind words. I do aim to make my guests feel at home and comfortable. Could not have asked for better place to stay! We had such a wonderful time in this unit and it was perfect for our family of 4. The owner, Mikell had it decorated for Christmas which was such a bonus! Also she had fresh flowers in all of the rooms. Everything was well thought out and linens were plenty and the kitchen was newly remodeled with updated appliances. Nauti Beach is super close to town so we walked a lot, however, we also rented a golf cart which allowed us to explore the whole island. Marla was fantastic about communicating with us, however I was not so good! She invited us to her restaurant - Javi's - which we had gone to the night before based on local recommendations. It did not dissappoint!! We will definitely be back and thank you all again. Also the wait staff at pool/beach were unbelievably attentive to us. Can't say enough how perfect this place was for us!! Mikell’s condo was so comfortable and cozy. I’ve been to Isla many times and this was by far the best accommodation. The pool is gorgeous and the beach perfect. We had a great stay and Mikell was a thoughtful host. Brittni who helped arranged the stay, checked in periodically as well. Great communication. Thanks, ladies!